Visit The Purple Zone website to learn more. If you are a Mainline Protestant preacher in the United States, chances are you will be addressing economic issues such as poverty, consumerism, debt or homelessness within the next 6 months. This is according to a survey of over 1200 clergy conducted by The Rev. Dr. Leah D. Schade, Assistant Professor of Preaching and Worship at Lexington Theological Seminary in Lexington, Ky. Over half (56.92%) of clergy reported that economic issues would be among the top five topics they intend to address from the pulpit over the next 6 months. Racial and/or ethnic issues came in second, with 49.28% of pastors saying they plan to speak about this topic in their preaching. The survey “Preaching about Controversial Issues” is one of the largest surveys on preaching and sermon content ever conducted in the United States. As part of Schade’s research into how preachers are approaching their sermons during this divisive time in our nation’s history, she designed and conducted a 60-question online survey directed to Mainline Protestant clergy serving congregations in the United States. The survey ran for six weeks, from mid-January to the end of February. One of the questions listed 19 choices of topics and asked respondents to pick the top five they intend to preach about in the next 6 months (see charts below for full list). How does this ranking compare to what preachers chose to address before the 2016 presidential election? Schade also asked preachers to indicate topics they had mentioned in sermon in the previous 12 months, drawing from a list of 38 issues. When grouped according to categories, “Economic Issues” and “Racial and/or Ethnic Issues” were also ranked #1 and #2 respectively. But the issue of “Immigration/refugees/migrant workers” rose to #3 compared to its previous position, while “Food insecurity and hunger” moved down to #4. “Ethnic and/or religious discrimination issues” rose in importance for pastors to address in the coming six months, while “Equal rights” and “Interfaith relations” remained about the same. “In many ways it’s not surprising that preachers continue to rank economic issues as their foremost concern,” said Schade, noting that the Gospels mention the subject of money more than any other topic. “Jesus talked a great deal about how to handle money and possessions. As we’re grappling with the widening gap between the haves and have-nots in this country, it makes sense that preachers are addressing justice issues that have to do with the fair distribution of resources, housing, and the ongoing issue of exploitation of those with limited access to funds,” Schade observed. She also pointed out that many of the issues listed in the survey intersect and overlap with each other. “For example, systemic and institutional racism contributes to poverty and hunger among people of color. And climate change impacts the refugee crisis, which is also complexified by Islamophobia and xenophobia,” Schade observed. Schade also noted the topics that preachers ranked lowest on their list of priorities to address in the coming six months. “Disabilities,” “Human trafficking,” “Terrorism,” “War,” and “Criminal justice reform” all ranked below 10% among topics preachers intend to address in their upcoming sermons. “Ministers have to prioritize, and it’s interesting to see the issues that have moved lower as others come to the forefront in relation to executive orders and policies of the Trump administration,” said Schade. She also noted one topic that rose in importance for preachers to address: environmental issues. “Things like species extinction, pollution, and environmental racism ranked at the bottom of the list of things pastors addressed in the last 12 months – less than ten percent in most cases,” Schade said. “But environmental issues saw a slight bump up to 17%. This may be due, in part, to the realization that the Trump administration is undermining all aspects of environmental protection, from gutting the EPA, to reversing key environmental regulations, to dismissing the reality and dangers of climate change,” Schade suggested. My preaching does not address specific issues. I talk a lot about the Biblical importance of justice and care of the poor, stressing human dignity and our responsibility to be good stewards of all that God entrusts to us. I try to give people tools to do their own assessment of the issues that they are concerned about. Other respondents noted that they do not decide what they will preach about until that week, but will often mention current issues as they pertain to the biblical text. Lexington Theological Seminary; Lexington, Ky.
And visit her website, https://www.thepurplezone.net/ for more information. * The margin of error for the survey is +/- 3.2 percentage points at the 95% level of confidence. In addition to sampling error, survey may also be subject to error or bias due to question wording, context and order effects. Survey was designed and conducted using SurveyMonkey.com. Welcome to The Purple Zone! Welcome to The Purple Zone! In a society increasingly polarized and averse to respectful dialogue, our churches reflect the wide range of viewpoints across the Red/Blue divide that can entangle pastors and parishioners within divisive controversy. And yet the prophetic and Gospel witness of the Bible compels us to address contemporary justice issues. There is much at stake: incredible amounts of wealth, questions of power and equality, the ecological conditions that support life itself, and the very real persons affected by these issues all have a stake in our conversations, decisions, policies and actions. How do we listen to each other across hostile divides of red/blue politics, race, class, gender and sexuality, geography, culture, and religion? How is God speaking to us through these difficult conversations? I am the Rev. Dr. Leah D. Schade, your guide in The Purple Zone. A seminary professor of preaching and worship, a researcher exploring how pastors handle controversial issues, and an ELCA ordained clergyperson with 16 years of experience in parish ministry in diverse cultures and contexts, I am exploring ways that pastors can preach and do ministry that is true to their gospel calling, while recognizing the many risks involved in courageous preaching and ministry. How can we be both pastoral and prophetic? This is one of the driving questions of my work. The challenge of addressing controversial justice issues from the pulpit is fraught with risks, but also offers opportunities for proclaiming the gospel and building community in profound and contextual ways. This work is also for Christians in congregations looking to develop strategies for initiating and navigating conversations around “hot topics” while maintaining relationships and emphasizing God’s creative, hope-filled and redeeming activity in our world. I am particularly interested in exploring how the process of deliberative dialogue can be useful for moving us beyond “fake news” (aka “viral deception”) and “alternative facts” to a place where we can respect each other’s humanity while moving toward reconciliation and rebuilding, while – most importantly – protecting those most vulnerable in these conversations. This blog will offer articles informed by my research in which I surveyed 1200 Mainline Protestant pastors in the United States about how they are approaching controversial justice issues in the pulpit. I will also be sharing reflections based on my experiences listening to pastors, parishioners and ecclesial leaders, as well as book reviews, lists of resources, and any other tips and tactics to help us move and minister within The Purple Zone. Visit https://www.thepurplezone.net/ to learn more. And stay tuned for more posts! Learn more about the Purple Zone . 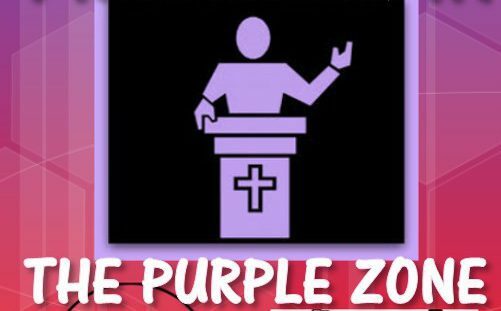 . .
To learn more about how you can more effectively preach and do ministry in the Red/Blue divide, visit: https://www.thepurplezone.net/. More about the Purple Zone . . .
Visit https://www.thepurplezone.net/ to learn more about how you can preach and do effective ministry in the Red/Blue divide. "Disintegrationism: How We Got Here, Where We Go Next"